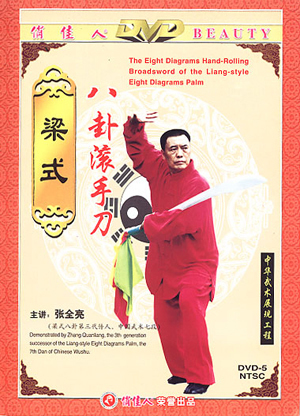 It is one kind of traditional weapon routines in Eight Diagrams School. The Eight Diagrams Hand-Rolling Broadsword literally means that rolling hands, stressing the power of the wrist, is its unique style. It requires that the player's body and the broadsword should move as one in the course of walking, turning, revolving, with the body following the weapon. All the movements are in linked changes.